Most of our interactions are now catered for online—from social media accounts to emails to surfing websites. The online services have surely made our lives easier. But as we’re so much reliable on online services, there is also an increase in the rate of cyber crimes as well. To keep our accounts protected from cybercriminals and hacker’s majority of accounts now offer Two Factor Authentication to add an extra layer of security to our accounts. 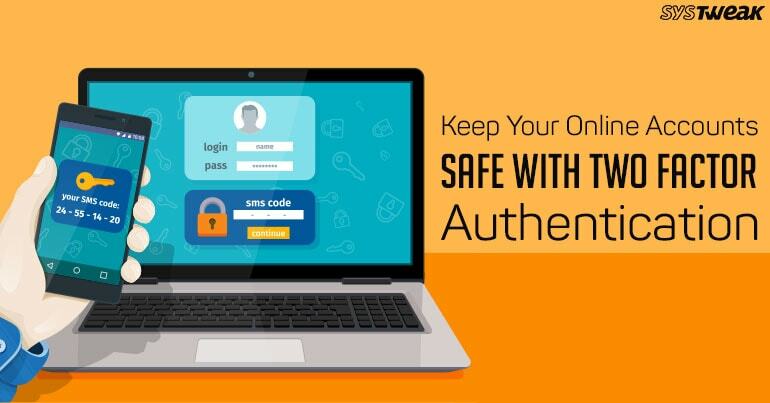 While logging in to your online accounts, Two Factor Authentication adds an additional security code that is required at the login time, other than account password. But no matter how strong a security measure may be, there’s always a loophole, the advantage of which is availed by cyber villains or thieves. Suppose your phone gets stolen or if your online password is hacked, in this case there’s a huge possibility that you’ll get locked out from your account and be unable to access it. Must Read: Do You Secure Your Online Accounts With Two-Factor Authentication? So, to make sure that this doesn’t happen, here are a few things that’ll help you to use Two Factor Authentication in the most optimized way. This is one of the most important things to take care of while dealing with Two Factor authentication process. When you set up two-factor authentication for an account, that website displays a bunch of backup codes to ensure that you never lose an access to your account. A majority of accounts even recommend us to print these backup codes and keep them somewhere safe. So, that even if lose your Smartphone, you still won’t get locked out from your account and would still be able to access all your important data. If you’re too lazy to print the backup codes here’s what you can do. You can preferably take help of a third-party application like Authy, that’ll sync your two factor tokens between your devices. So, if by any chance your phone gets stolen or you switch to a new device, Authy will have all your two factor codes saved at one place so that you can easily access your online accounts. It’s like creating an online backup of security codes so that they never get misplaced. While using Two Factor Authentication, your cell phone plays a crucial role as majority of security codes are sent on your device. So, just make sure that you keep your phone number updated on all your major online accounts. Even if you change your cell phone number, don’t forget to update it on your online accounts. Some websites even use your authenticated email address to send security codes. Just make sure your email addresses you have on file with your accounts are current and well-updated. Many organizations including Microsoft and Yahoo have a tendency of deactivating your email account if it hasn’t been used since a certain period. You should always have a backup plan that helps you to get out from complex situations. You never know when and how bad you get trapped, and not be able to access your own account. So, to avoid any mishaps always make sure that all your current and accurate personal information is updated on your online accounts. In addition to this, always fill up security questions seriously as they may also help you to login in your account in case you forget your password. So folks, here were a few things to consider that’ll never get you into trouble. Dealing with online accounts is pretty simple, if you keep these above-mentioned tips in mind. In case of any other query feel free to hit the comment box. We’d be more than happy to hear your feedback!